Home » Event » The Adrenaline Rush! 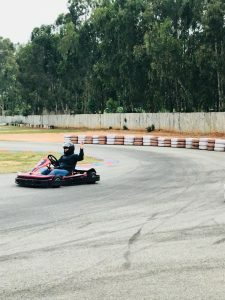 This is a 600 meters length racetrack, apart from a good number of hairpin turns which ensure that you have a quick thrill of a driving experience which lasts for full 10 minutes each in a 7 BHP kart. 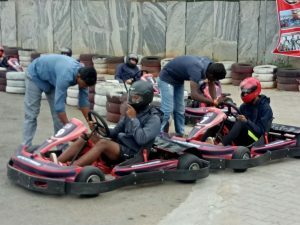 The kids had a great time driving on a winding circuit for about 30 minutes of two different levels. After the race a time of relaxation hanging out at the restaurant right at the karting centre. They were given 4 choices…. The students choose ‘level 1’ and ‘level 3’ by the older boys. Not surprising, as Daneesh is already racing at National Level on the same track. 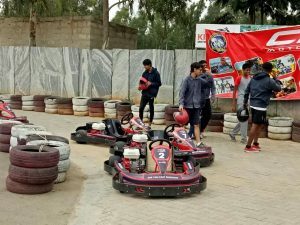 The personnel were nearby to kick the karts to life. 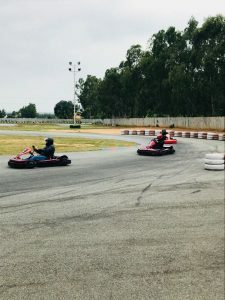 Track was challenging and well developed for those who intend to overtake without crashing. You have the need for speed? … Of course, throttles and brakes allow you to slingshot past fellow drivers! The closest thing to real racing where the driver’s skill makes the difference. Overall it was fun. No complains… you get what you’ve paid for. 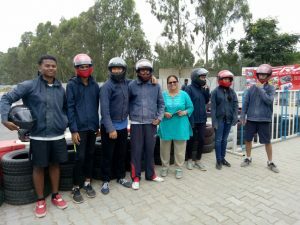 Safe with Helmets – clean jackets, nothing short of thrills. The perfect spot to spend having fun and racing with your peer.